Action Andy & the Hi-Tones like their records in color, releasing Songs 4 Swingin’ Sinners on marble blue vinyl and High and Lonesome on red vinyl. 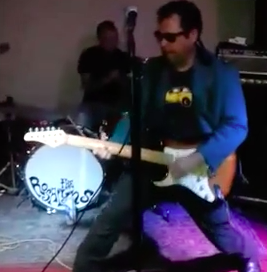 “Relampago-go Records is releasing Songs 4 Swingin’ Sinners on marble blue vinyl,” reports Andy Rasmussen of the upcoming EP from Action Andy & the Hi-Tones. It’s the latest wax offering from the band, which also recently reissued their High and Lonesome LP in a red vinyl edition of 300 copies. Songs 4 Swingin’ Sinners debuts February 18 at the Black Cat Bar. “We’ll be doing songs from the new EP, plus our own brand of garage-a-billy classics, or whatever you wanna call it. Maybe we’ll throw in a Johnny Kidd and the Pirates or a 13th Floor Elevators song. It’ll also be our bassist Jeremiah Silva’s last show with us, so we want to make sure we give him a good sendoff.” The bill includes the Santa Ana Knights and Johnny Deadly. Saturday, February 18, 2017, 8 p.m.
Other locals with all-new vinyl releases on the way include the Bombpops, Jason Lee & the R.I.P.tides, Planet B, and the Mattson 2, with wax reissues dropping from the Lulls (Island of Daughters) and Pepper (No Shame).